Squeee - this is the sound of me squealing in excitement. 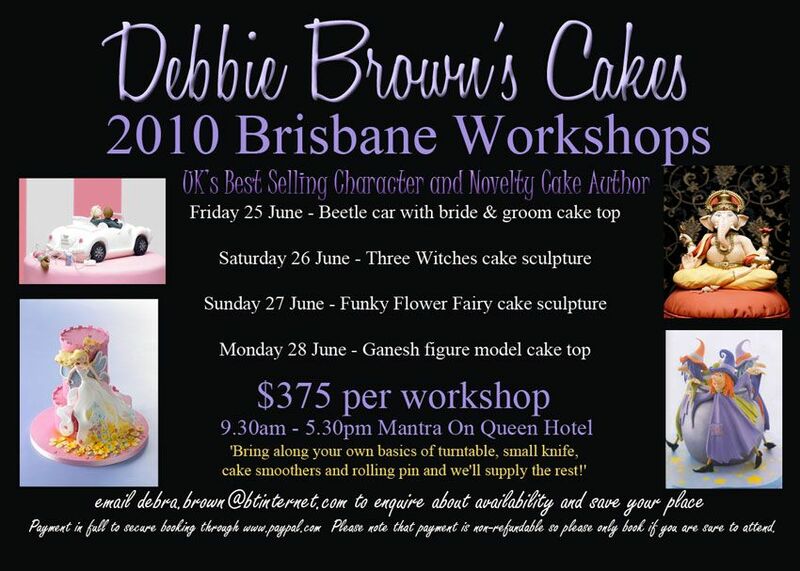 I have just booked in for a Debbie Brown Cake decorating workshop to be held in Brisbane, Australia in a couple of weeks time. 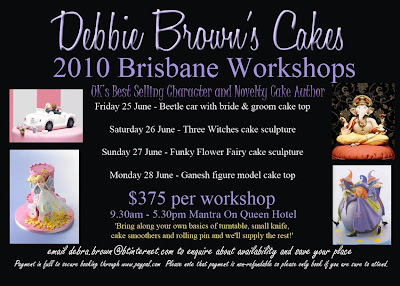 Debbie Brown is the author of numerous amazing cake decorating books. I just had a quick peek in my bookshelf and saw I have 50 Easy Party Cakes, Enchanted Cakes for Children and Cartoon Cakes, and I can't say this about all my decorating books I have actually used these books to make at least 4 different cakes I can remember with pretty good results. and when I just popped into the online bookstore to get these pics - I saw a new book on the way pictured below Gorgeous and Gruesome cakes for children. Wahoo! looks fabulous. Anyhoo back to the workshops, there are 4 different workshops with a different cake to be made each day, I wish I could attend them all but I had to contain myself and just pick one. If your thinking of attending you will need to bring some of your own equipment a rolling pin, cake smoothers- a turntable and a small knife. At the end of the day you get to take home your very own made with your own hands and love creation. Yes we do seem to be a bit lucky at the moment. Planet Cake has courses in Brisbane as well and we have a Hilton Masterclass coming up in July. I liked ur workshop in Cake Decoraters..